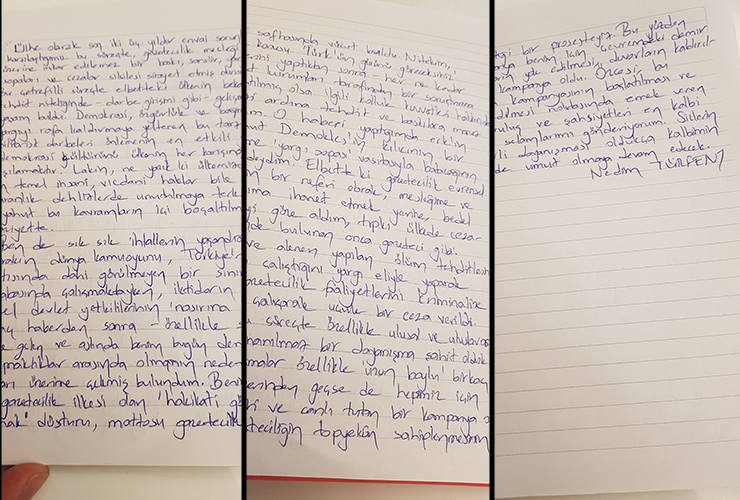 Nedim Türfent's handwritten response from prison to a letter of support from international press freedom groups. Seven international and local press freedom groups, including the International Press Institute (IPI), have sent a letter of support to imprisoned Turkish-Kurdish journalist Nedim Türfent, who has been held in solitary confinement in Turkey’s Van Prison for nearly two years. Türfent was convicted in December 2017 on terrorism-related charges for reporting on the activities of Turkish special forces in the country’s southeast. The court sentenced Türfent to nearly nine years in prison despite egregious violations of Türfent’s right to a fair trial. Most notably, 19 of 20 witnesses called by the prosecution testified that they had been tortured into giving evidence against Türfent as part of the initial investigation. Judges reportedly ignored those claims and found Türfent guilty based on the “disturbing” nature of his reporting. The letter to Türfent is below, as is his response. “As long as you show this valuable solidarity, hope will always continue to remain in my heart”, he wrote in return. 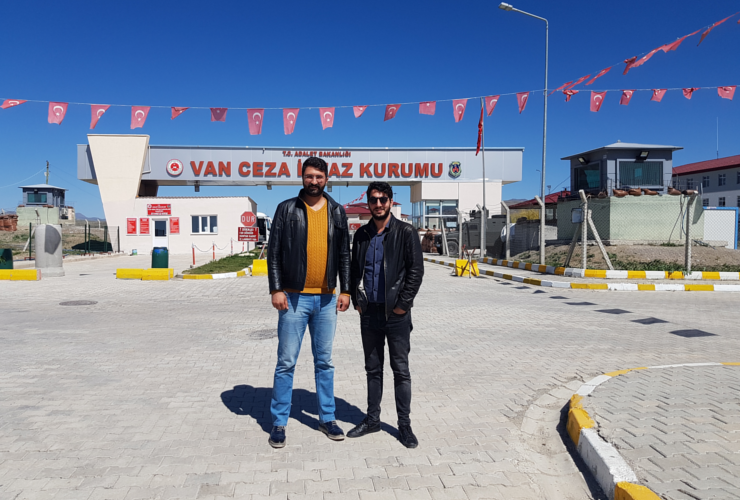 Veysel Ok (right) and Barış Oflas, lawyers from Nedim Türfent, in front of Van Prison, where Türfent is being held. Firstly, we send you our greetings as organizations working to promote freedom of the press and freedom of speech. We have been following news of your case since it began and were very alarmed at your arrest and the terrible conditions in which you have been kept for so long. We know you were just doing your job as a journalist and you have our respect for continuing to work under such harsh and threatening conditions. IPI has been conducting research into the online harassment you received at the hands of the security forces before you were arrested and will be reporting on this. We are monitoring the decline in press freedom in Turkey and the closure of news agencies such as Dicle, for which you worked, and we would like to run a campaign, with your consent, to bring your story to a wider audience in Europe and the rest of the world. We will highlight the injustices in your case and the terrible treatment of the witnesses. We would like you to know that we will work across a broad network to let people know what has happened to you and to ask them to write to their governments so that they can put pressure on the Turkish authorities to honour their commitments to human rights and to release you. Journalism is not a crime and we know you are not a criminal. We are deeply upset that you appear to have been targeted because you are Kurdish and because you were reporting news from the border regions that the authorities do not want to be published. You have our admiration for your work and your dignity and we would like you to know that we will support your lawyer’s case at the European Court of Human Rights. We will not stop until we get a good result. Our organizations support the free flow of the news and the right of the peoples to receive balanced and critical news reporting. We believe that journalists have a basic right to report on the news in the southeast of Turkey and to do their jobs without being targeted, harassed or arrested. With your assent, we will advocate on your behalf at European government and European Court of Human Rights levels so that we can assist in securing your release and that you can return to your vocation of journalism. We send you our warm salutations. Stay strong and do not give up hope. We will work hard for your freedom. “We have faced a great number of problems over the past two or three years. The profession of journalism has been subjected to an undeniable level of pressure, censorship, attacks from the judiciary and a cycle of punishments. It is true that, during these highly complex times, events such as the attempted coup have occurred which have served to threaten the very fabric of the country. The most effective method of preventing such militarist coups that seek to destroy democracy, freedoms and the independent judiciary is to introduce the culture of democracy to every corner of the country. However, unfortunately, even the most fundamental and conscientious rights in our country today have had their essential meanings hollowed out or even worse, have been abandoned inside dark dungeons. 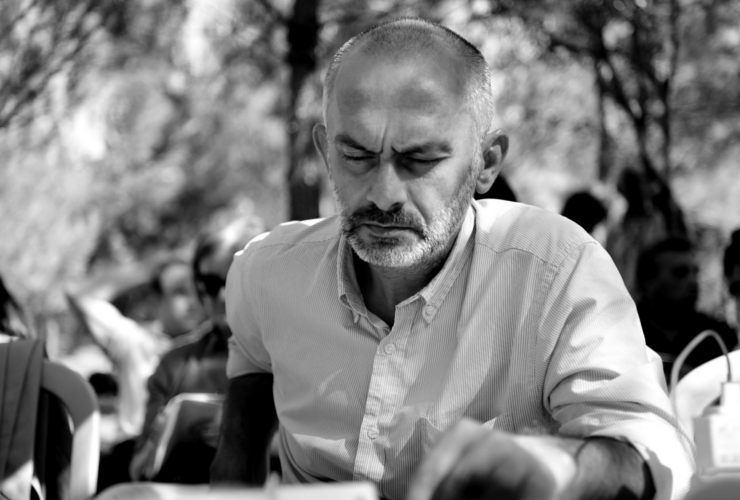 I found myself as the main target when I worked in a border town where violations were not only frequent but were invisible to western of Turkey, let alone the global public. Whilst working in the border town I published a number of news reports that stepped on the government’s toes – and one in particular that became a symbol and which is the real reason why I am currently locked behind bars. In my case, the code of conduct and motto based on the journalistic principle of “making truth visible” has materialized at every level of my journalistic career. As a matter of fact, after publishing the news report titled “You will see the power of the Turk” I was subject to consecutive threats and pressure imposed by the state security forces even though the state authorities had already launched an investigation into me. When I reported that piece of news, I was aware that the sword of Damocles or of “power” would fall on me in some way or other by means of judicial punishment. Certainly, as a soldier of the universal family of journalism, I chose to pay this price instead of betraying my profession and my own conscience. Just like the scores of journalists locked up in the prisons inside the country have also done. An incredible sentence was handed down to me, achieving what the overt and verbal death threats wanted to achieve through the judiciary by criminalizing pure journalistic activity. Throughout this ordeal, we have seen an incredible level of solidarity in the “national and international” arena. Although this solidarity has mostly occurred through some “tall” acquaintances – and I refer here to my lawyers who are both over six feet tall – it has kept hope alive and strong for all of us.